Put it in a box or not? I guess this is more of a marketing question than a new product idea, but hey, what good's a product if nobody wants it? So, how come all the projects (SparkFun's and everybody else's too) are all open-faced PCBs? I'm using the kits as picture examples, but the same is true for most individual projects that I see. Is that what people prefer or is it just too hard to make a good enclosure and front-panel? I get that we're prototypers and need easy access to the hardware, but sooner or later our wizbang widget get's sent out into the world, right? What if the enclosure/front-panel was good-looking, cheap (ok, "economical") and didn't take six iterations to get right? In other words, is the lack of enclosures an engineering+economic problem or is it that there is just no interest? I've seen several postings recently related to enclosures. Is that an indication of level of interest or just random? I really want to hear your response. I'm not a troll. I've posted in these forums over 100 times. I'm an engineer and I have some ideas of how to attack the problem if it is engineering or economic, but before I consume even more posting space, I want to find out if anyone cares. What do you think? Put it in a box or not? - Or I do it all the time. There's plenty of solutions that Chip is not seeing. Well, being a electronic enthusiast, I like the look of PCBs. Most of my designs are one-offs and they stay in home so it doesn't matter if they have no enclosure. But if I were to want an enclosure, I would probably find it difficult to find an enclosure that wouldn't require lots of modifications to suit my designs. That is most likely the main reason why people don't have enclosures for all their projects. Another reason would be, is an enclosure really necessary? On the multiple choice quiz, I would say all the above. But if I had to pick one, it would be "I'd like to but it's too hard to design / craft." Especially if this project would be going to production. On a personal level, I would choose, "I'd like to but there's nothing available that meets my need" just because most designs are so different it's hard to find an enclosure that would fit my project. I do have a 3D printer so I just design and print my own enclosures. The other choice would be "No thanks, I like the open PCB look." I like for people to view me design work. The short answer is that the infrastructure for short run PC boards and small quantity components is very highly developed and automated. Customizing off the shelf enclosures requires more manual labor and doesn't lend itself to batching like PC boards. Example: you can make an entire panel of say 20 boards at once and the fab shop will charge a low fee because it's cheap to process. Then you can get a stencil made that will allow you to apply paste to all those boards in one sweep. Then you can stuff them and bake them all at once and depanelize when they're done. Even testing can be done as a single operation if your fixture is big enough. Essentially the same labor cost to make one board or 20. Contrast that with what you have to do to customize an enclosure (forget full custom: tooling costs are well into the 5 figures!). Even with a CNC milling machine, someone has to load the enclosures into the machine. Typically one at a time, but if all the customization is on one side, then perhaps you can load up a bunch. They have to be placed precisely, so a fixture has to be made to hold them in place. Then each one has to be milled out. Making 20 enclosures takes 20x as long as making one. Then someone has to unload the machine, and load up the next batch. Even if the shop has a robot, the quantity is likely too small to make it worthwhile programming the robot to do this pick&place operation. If you need cutouts on more than one side, then more manual costs to unclamp and rotate the enclosure and reclamp it in place, or some shops will have a trunnion table in the mill that can add a rotary axis. Then factor in that the enclosures take up much more shelf space than boards, and cost more so now your inventory costs go up. So it can be done, but my hunch is that a store that caters primarily to hobbyists and students would not make enough profit for it to be worthwhile. Enclosure modification is in roughly the same place that PC board making was 20 years ago. Back then even a single small prototype board would cost a few hundred $$$ minimum and likely $100 for each additional board. Then you had to stuff it and solder by hand (stencils also cost an arm and a leg). If you were lucky, you had a wave solder machine or a cheap SMT oven. On the other hand, it cost about the same to modify an enclosure today as it did 20 years ago. I had considered offering a service like this, but then I realized I'd have to charge so much to make it worthwhile that I'd be outcompeted by the likes of FrontPanel Express. Sorry for the ramble. I've also seen the many, many questions about making enclosures and boxes and given a lot of thought to basing a business around it. At the very least, it might be a way to get a laser cutter to pay for itself. The primary reason for the requests is that most people don't have the tools or skillset to modify enclosures easily. In the end, I concluded that there isn't enough of a market to be worthwhile. Many of the popular enclosure makers already offer cutouts and printing at quite reasonable prices. The only thing I could add would be lower setup fees and even then, I can only go so low: not many people will pay even $30 to drill a few holes in a $5 enclosure. The guys doing instrument panels have the advantage of (1) having a market that will bear the cost and (2) working primarily with 2D flat surfaces that can be easily registered and a lot of the work automated (I think). The hobbyist market is hard to make money at unless you can really move the volume. Thank you both for your thoughtful comments. My thinking is pretty much along the lines of yours, Lyndon, but being a nerd I also appreciate the "open PCB as art" aspect that you raised, Codlink. In my mind there is another issue that further raises the cost. That is, the number of iterations required to get something usable. If it takes three attempts to get a sufficiently error free result then even a $30 front panel is now $90. That's clearly too much for most student or hobbyist projects. But the cost problems are merely engineering issues. They can be solved by many of the same techniques that have brought down prices of PCBs. Open sharing of experiences and results, combined with today's materials and tools I'm convinced would bring the costs down. The circular question to be answered then is that IF the costs were reduced for (easily) producing a usable (functional, attractive, consumer-level durable) enclosure and front panel, would there be sufficient demand to justify the investment needed to reduce those costs? The investment is not enormous. For the most part it is not even worthy of a Kickstarter campaign. But part of the "cost" for the maker / hobbyist is accessibility and availability which requires the backing of at least one retailer. And before a retailer like SparkFun takes on yet another SKU (and associated documentation, promotion, tutorials and such) they would need to believe that it is something that their customers would want and buy in sufficient quantities to bring SparkFun a decent return. I had hoped for a string of "if it was cheap I'd use it" sort of responses. The two of you have provided quality responses and validated my thinking, but so far the response volume is too low. Still, it's only been a few days. I'll watch the thread for a few more days to see what happens. I'm also jumping the gun just a little. I have a couple of prototypes in the works that will add picture examples to my claims of functional, attractive, etc that I hope will sway folks to at least participate more in the discussion. Those are a week or two out (though Shapeways just delayed a bunch of orders indefinitely, mine included). I'll bump this thread when I can show off a prototype. In the meantime, thanks again for your responses! uChip wrote: Anyone else care to comment? That is from somewhere around 1976. It is a single side PCB, suspended between two sheets of clear plexiglass (1/8" thick) then held together by a couple of long screws and aluminum spacers. First learned EE at the juncture of vacuum tubes and solid state, Still learning. I am mechanically challenged so enclosures look cool, but they take me a long time (and money) to get it right. Even the Arduino ones were troublesome. I do think there is a market (places like ponoko, polycase, okw showcase a market). I like the look PCB look, but I just started making my own enclosure for a project. Much like cosmicray posted, it's just two pieces of acrylic held together with spacers and screws, as you can see here. I have a small CNC machine so I tried my hand at milling the acrylic panels myself. Not that steep of a learning curve, only cost me an endmill and one piece of acrylic stock. But after that, it was smooth sailing. I think there would be a market for enclosures. Front and back assemblies would be the easiest to do, and I think could run around the same price as some similar sized custom PCBs. Have the customer supply the 2d drawings, let them choose stock thickness and color, and you have potential for a nice little side business. Is your CNC machine bought or did you build it from plans? I would love to get my hands on a CNC machine and was curious of what you have. I do have a 3d Printer so I am not a total noob.. Most of my enclosures are from acrylic. But I am cutting it the old fashioned way, with a scoring knife. Bought myself a Shopbot Desktop with spindle attachment (comes built). I'd recommend buying over building, It's easier and the end result is better. No complaints about the Shopbot either, good hobbyist level machine. Check out their forums too, they have a nice community going. Got a nice little confidence boost cutting that acrylic, going to try my hand at milling aluminum again. It's been way longer than two weeks, but I do now have a prototype to show off. I'll put this prototype in the functional category since I believe it is too busy to claim to be attractive. The intent of the prototype front panel is to show off the variety of switches, connectors and displays that the proposed enclosure solution is capable of. Going back to our earlier discussion, it took me two iterations to get the enclosure pieces right and I'm up to test #9 on the front panel. But now that I have this working I intend to publish (open source hardware) my results so that others can make use of it and have something that looks good and works on the first iteration. And although I have more hours than I care to count getting to this point, the next design I do will literally take just minutes. And it can be done by people without any skills at machining or mechanical design. I call this system StdBx and it is indeed a system, not just an enclosure or front panel. In addition to the desktop-style box, I intend to also design a wall-hung version (think thermostat or sprinkler controller) that is based on the same design principles. I'm open to other form factors if there is an interest. The process for using the system goes something like this: When designing the circuit board for your project use parts from the StdBx Eagle CAD library. You can use any electronic parts you like but stick with the ones in the StdBx lbr for buttons, switches, displays and connectors. Add text to your layout for front panel labels and indicators. Once your layout is complete, click on the StdBx ULP to have the panel design files created. Send those files off to a laser cutting and engraving service like Pololu. Have your PCBs fab'd. Print the enclosure pieces or order them from Shapeways or Makexyz. Once all the components have arrived assemble them into the enclosure with a screw driver and soldering iron. Notice what is NOT in the process. There is no mention of entering a correct PCB or panel size to fit the enclosure. There is no mention of buying raw materials, marking, cutting, drilling, milling, silk-screening, sanding, painting or anything else to get things to go together. There is no mention of finding components that fit or having to get out the calipers because the datasheet doesn't have the info you need. Each library component includes vendor part numbers and is readily available from Digi-Key, Mouser and/or SparkFun. There is no mention of aligning front panel measurements to PCB measurements. The CAD tool does this for you. There is also no mention of buying yet another CAD tool. This solution builds on Eagle CAD. Everything you need is in the free Eagle version plus the StdBx add-ons. Here is a list of the components shown in this sampler prototype. Also available in the StdBx lbr but not shown. As of this writing there are over 30 StdBx defined library components that represent over 80 real vendor parts. More are being added as they are needed. All parts are Through Hole technology. You DON’T have to be good at Surface Mount soldering to build with StdBx. As you can see in this picture the StdBx system is based on a mechanical architecture similar to that used by the JYE Tech Function Generator or any number of other instruments. There is an acrylic faceplate with a PCB behind it. The PCB is small enough to be designed with the free version of Eagle CAD, but can have a little over 8.5 square inches of circuitry. 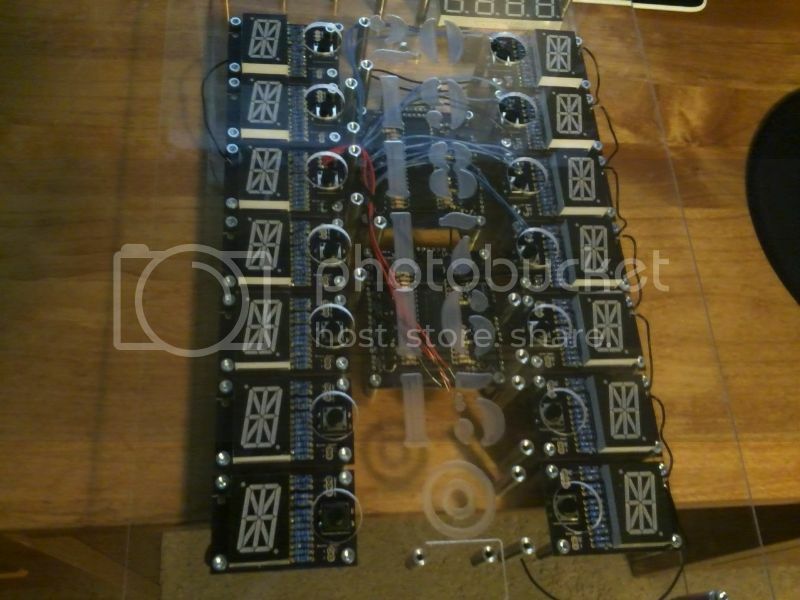 If that's not enough, the enclosure supports more PCBs on the back panel and floor of the enclosure for a total of 26.5 square inches of circuitry. And you can add even more PCBs if you want. You don't have to use that much PCB but it's available if you need it. The floor of the enclosure is also sized to fit a 4xAA cell battery holder for more portable projects. You can use standard panel mount connectors on the back panel instead of a PCB. The two shown are a barrel jack for power and a rugged USB-mini-B connector with FTDI serial converter. I need to create a tutorial example that really highlights it, but I believe that this system addresses the "it's too difficult to design and craft" roadblock we've been talking about. The cost is not horrible, but still too high. I believe it can come down significantly. The custom acrylic front panel costs about $14 but I think that can be lowered to under $10, hopefully under $8. The simple black back panel costs about $4. The enclosure consists of two identical pieces which cost about $28 each from MakeXYZ or about $52 each from Shapeways. That puts the total at about $70 to $118 depending on vendors. Like I said, that's high, but it's in the same order of magnitude as a Polycase with a lot more customization and integration. If you have your own 3D printer the enclosure price comes down to just the cost of the plastic. If we could convince SparkFun or someone to do a run of injection molded plastics and sell a pair of them for say $20 then the total would ultimately come down to about $32. That seems pretty reasonable to me considering the quality of the result. STATUS: This is NOT finished yet. There is a ton of documentation that needs to be done. To get the acrylic costs down I need to code up and test a new ULP. I have not yet approached SparkFun or anyone about manufacturing the enclosure. Most of the components work pretty well but a few need some additional tweaks (e.g. the bezel on the LED display in the photo needs to be thinner). Everything needs to be made "publish ready" and posted to GitHub. There needs to be a process established for validating new components. I’ve had a couple of projects in mind while I designed the sampler. I did this to keep things grounded as I imagined the design. I’d like to build these up as examples. Plus I’m sure feedback and more thought will turn up more things to get done. None of the work I’ve listed to finish this off requires invention (well maybe the ULP) it just requires time and effort. I intend to continue pushing it along but given the level of response so far that's driven by my OCD. I do keep reading about folks who are looking for a better enclosure. Perhaps once people see this solution it will appeal to them and there will be more interest. Then again, maybe not. In any event I will keep at it for a while at least. Your continuing feedback is much appreciated. Thank you! to everyone who has contributed to this thread so far. I'm enjoying seeing the attractive and creative designs others have done. Now you have peaked my interest. That example enclosure looks amazing. I can see that you have thought this through and it shows in the professional looking design. Using Eagle is a good idea. Just to throw this out, if you need any help, I am experienced with Eagle and I have a 3D printer (I don't know if you have one) so if you need any help just send me a PM with your email or whatever and I will be glad to put some time in. And no, I don't need to get paid or any incentive to help. Like I said, you've peaked my interest and just willing to help. Just an example, If you gave me a list of products I could make libraries for them..
That looks really good. Are you using Pololu's two-tone panel material? There may be some cost savings by using an off the shelf clamshell enclosure. I think you can purchase some of them without the end panels. Thank you for your enthusiastic response. I'm at the 80/20 stage. 80% of the work is complete but the remaining 20% will take 80% of the effort. I need encouragement to really finish it. The best encouragement is knowing that people would like to use StdBx. I don't have a list of parts for you to work on. Instead, I need three things from you or anyone who wants to contribute. 1) I'm up to my eyeballs in this design. I'm sure I'm to the point where I'm so involved in it I can't see it any more. I need others to review what I've done and (gently) point out the holes and deficiencies. Think about what you would build with StdBx. Can you build it with the tools and parts I've described or would something be missing? If that missing thing is another switch or display, then by all means, go ahead and make a library for that part and submit it. Or at least tell me what's missing so that I can see the hole. BTW, the hole might not be a component. Maybe it's a missing step in the process or one that's still too hard for most people. 2) The biggest effort so far has been researching components that fit. For each button on the list I studied the datasheet of a dozen parts to find what would work. Then I bought a couple of parts of each of several candidates to test. Once the parts arrived I measured them with calipers to see that they matched the datasheet and determined those measurements that were important to me but were not on the datasheet. For instance, the push button gives it's height on the datasheet. So does the button cap. But how much the button shaft goes into the cap is not given so the only way to get the overall height is to buy some and measure. Once I settled on which component to use I created a component in the library and designed and ordered a test PCB. I also designed and ordered a test panel. Once all these arrived I could test to see that the component actually works as spec'd and that my library entry is correct. On a couple of occasions a component didn't work out and I had to go back and start again. Think about how this should work. How do we let anyone contribute, but keep the promise that everything in the system works together. There needs to be some sort of validation process that additions go through to ensure they work and so that people trust that they work. How should that validation process be done? Who performs the validation? What are the requirements? Is control centralized or distributed? What tools can we bring to bear on the problem? 3) Even before we institute the validation process, I need feedback on the initial components. If you like you can call this beta testing. I would like for you (not just codlink but anyone.) to print out (or buy) a couple of enclosure pieces and try them out. I need someone who is willing to build a project using the library components and have a laser cut front panel made. The most important contribution would be to report back either that things work or report what doesn't work so it can be fixed. And note, all this would be at your own expense. I've spent a few hundred $$$ getting to this point but I can't fund your project. You need to go into this knowing that the money you spend might or might not get you the enclosure and front panel that you like on the first try. The value that you are adding is that you are helping to prove out components and the overall design. Once components are proven, you and others down the road can build nice looking projects that come out right the first time. If I release this too soon and people get frustrated or have a bad experience, then StdBx will get a bad rep and fail. On the other hand, I can't wait for it to be finished to release it, because it will never be finished. The whole point is to have StdBx evolve and grow to meet the needs of the community. I do need some folks to try it out. The documentation isn't even well started yet, so the beta testers need to be savvy enough to figure out some things for themselves. Or maybe you help write the documentation (there is nothing like going through it for the first time to catch all the little steps that are automatic to me now). Or answering your questions helps me find the areas that need documentation. I'm not going to judge who's savvy enough and who isn't. You self-select in or out. Still I will need to create some minimal documentation to help even the most savvy get started. That will take me a little while. I think encouragement and patience in equal amounts is about the right formula. The panel is a sandwich of layers. One of the layers is indeed a two-tone (the manufacturer calls it two-ply I think) acrylic but not from Pololu. I researched several materials and had samples built from a couple of different ones I had shipped to Pololu. Once I settle on the final material choice I intend to lobby Pololu to stock that material. Whether they do so or not will probably depend on how they perceive the opportunity and demand. There seem to be an infinite number of enclosures out there already, but I did not find one that meets the needs of this system. They were either the wrong shape or the dimensions were too big or too small. That doesn't mean that they are bad or can't be used with StdBx. There needs to be the concept of a design point which is supported by the process and components in StdBx. I call this first design point "Series100" because it is designed around the 100mm limit in the free version of Eagle. There will be other design points perhaps based on more off-the-shelf enclosures or other features. Some of the components will be reused from one design point to another and hopefully much of the process will be reused. For now I am focusing on just the one design point to get things started. If you know of an enclosure that is close to what I designed, please pass along a reference. As you said, a mass produced enclosure cannot help but be cheaper. Even if there is not a direct substitute for my design, I am hopeful that we can get someone (SparkFun?) to mass produce it and sell at a lower price.